This post isn’t paranormal related, well maybe it might be because of all the unussual problems associated with it. I have been trying to sell a house and land that was left to me by a family member passing away. I have been through four lawyers who have just up and excused themselves from this case. Two family members whom were appointed executors of this case are now being uncooperative. My wife and I are are now having a very hard time because of this situation. What would you, the reader, if you’ve experianced anything simular to this, do about this situation? I am now in contact with yet another lawyer who is very interested in this case and is asking all the right questions. I suspect there is a sum of money in the inheratence that was never disclosed to me, but should have been by law, and just maybe a family member knows this and is trying to stall this case to get to it. What do you think? Any input to this would be valued! I decided to do something differant today…I decided to use a few differant ideas for paranormal related items and apply them to goodies we all either have or would like to have. One of them is a pretty cool mashup of pics I had made not long ago, one of a personal fav: Stonehenge. I used a cool Stonehenge pic with lighting in the background and applied it to a nice mug. The link is below if you’re interested in getting one. The other is a Fox Mulder inspired theme. It’s a pretty neat magnet with a UFO capture with some appropriate wording to it. You can see both on the same page. You can find my products right here. A lost world has been found in Antarctica, preserved just the way it was when it was frozen in time some 14 million years ago. The fossils of plants and animals high in the mountains is an extremely rare find in the continent, one that also gives a glimpse of a what could be there in a century or two as the planet warms. A team working in an ice-free region has discovered the trove of ancient life in what must have been the last traces of tundra on the interior of the southernmost continent before temperatures began to drop relentlessly.An abrupt and dramatic climate cooling of 8°C in 200,000 years forced the extinction of tundra plants and insects and brought interior Antarctica into a perpetual deep-freeze from which it has never emerged, though may do again as a result of climate change. An international team led by Prof David Marchant, at Boston University and Profs Allan Ashworth and Adam Lewis, at North Dakota State University, combined evidence from glaciers, from the preserved ecology, volcanic ashes and modelling to reveal the full extent of the big freeze in a part of Antarctica called the Dry Valleys. The new insight in the understanding of Antarctica’s climatic history, which saw it change from a climate like that of South Georgia to one similar to that seen today in Mars, is published in the Proceedings of the National Academy of Sciences. “We’ve documented the timing and the magnitude of a tremendous change in Antarctic climate,” said Prof Marchant. “The fossil finds allow us to examine Antarctica as it existed just prior to climate cooling at 13. 9 million years ago. It is a unique window into the past. To study these deposits is akin to strolling across the Dry Valleys 14.1 million years ago.” The discovery of lake deposits with perfectly preserved fossils of mosses, diatoms and minute crustacea called ostracods is particularly exciting, noted Prof Lewis. “They are the first to be found even though scientific expeditions have been visiting the Dry Valleys since their discovery during the first Scott expedition in 1902-1903,” he said. What do you think? Feel free to share your thoughts here. Here’s a pretty handy list of signs of a haunting at your house etc., I felt this list needed to be posted here (also because of what my wife and I are going through at our own house). Most of these are pretty obvious, but some of these may apply to your situation. Doors, cabinets and cupboards opening and closing – most often, these phenomena are not seen directly. The experiencer either hears the distinct sounds of the doors opening and closing (homeowners get to know quite well the distinctive sounds their houses make) or the experiencer will return to a room to find a door open or closed when they are certain that it was left in the opposite position. Sometimes furniture, like kitchen chairs, are perceived to have been moved. Very rarely will the experiencer actually witness the phenomenon taking place. Lights turning off and on – likewise, these events are seldom seen actually occurring, but the lights are switched on or off when the experiencer knows they were not left that way. This can also happen with TVs, radios and other electrically powered items. Items disappearing and reappearing – this phenomenon, which we have dubbed “the DOPler Effect” (DOP = Disappearing Object Phenomenon), has been examined in the article “The DOPler Effect.” Others have called this “the borrowers” phenomenon, and it’s the familiar experience of not being able to find a regularly used item – say, your set of car keys – which you believe you placed in a spot you routinely place them. But they’re gone and you look high and low for them with no success. Some time later, the keys are found – in exactly the place you normally put them. It’s as if the object was borrowed by someone or something for a short time, then returned. Sometimes they are not returned for days or even weeks, but when they are, it’s in an obvious place that could not have been missed by even a casual search. Unexplained shadows – the sighting of fleeting shapes and shadows, usually seen out of the corner of the eye. This phenomenon has also been discussed in some detail in “Shadow People.” Many times, the shadows have vaguely human forms, while other times they are less distinguishable or smaller. Strange animal behavior – a dog, cat or other pet behaves strangely. Dogs may bark at something unseen, cower without apparent reason or refuse to enter a room they normally do. Cats may seem to be “watching” something cross a room. Animals have sharper senses than humans, and many researchers think their psychic abilities might be more finely tuned also. Feelings of being watched – this is not an uncommon feeling and can be attributed to many things, but it could have a paranormal source if the feeling consistently occurs in a particular part of the house at a particular time. Other physical evidence – unexplained writing on paper or walls; hand prints and footprints. All the above had been posted at another site. Since this list is actually pretty handy and you might want to print this out, I wanted to post it here for everyone to study and see if any of the above applies to your particular situation. The one thing on this list my wife and I have not had happen yet is the physical assault, and we do not want that to happen of course. As far as any physical evidence, we have had hand prints appear on a mirror hanging on a wall in our kitchen. The mirror measures roughly 3′ X 4′ or so, and a hand print had appeared (not before our eyes unfortunately…I would have loved to see that!) The hand print is NOT from any of us, nor is not from any visiting family etc. We have no children, and no other family has the keys to our house. So no accidental brushing or touching against or on the mirror could have happened. If any of the above from the list applies to you, please leave a reply here and let us and the readers know about it. New videos were added to the featured videos page for August. The now famous Georgia bigfoot carcass video has been added as well. Even though that whole deal stinks of scam and hoax, I couldn’t resist posting that vid for all to enjoy. Have you ever had someone tell you that your twin was just seen uptown when you were downtown at the same time, and you don’t even have a twin? Eight years ago I made a trip down to the deep south of the United States to meet my then soon to be wife. I had never been to the deep south before (being a northerner, or a yankee as I was called there, and having no twin, the following is impossible…) and upon going to one of the local gas stations there, I was asked how I liked a certain shopping mall I had just been seen at shopping the week before. I had not been in that region the week before, I was still in the north preparing for my trip down south. This person (a total stranger to me) said that he spoke to me for about ten minutes or more and that it was good seeing me again! Again, I have no twin. As in the true tales story from the paranormal.about.com site that you’re about to read, this also happened to me…an experiance with an time displaced/doppelganger time warp situation. The universe we live in is filled with so many things we simply do not understand, yet that is. Time displacement, time warps being only theory (so far anyhow), is one of them, and a personal favorite subject of mine. Too good to be true or not enough research? As if anybody truly had to become a super detective to figure out the motive and or reality behind the latest claim of a bigfoot creature actually being found. I’m referring to the one reported to have been found dead in Georgia by two bigfoot hunters/researchers. Again, I approach any cryptid, paranormal, UFO etc., story with scepticism. Not just blindly beleiving everything reported…even with pictures! As I had suspected with this story, that the actual remains needed and requested by the media to show the world of this discovery, couldn’t be produced. The supporting story is below, as well as the picture of this supposed bigfoot beasts remains. And as if that wasn’t enough, these two individuals made remarks about developing a business out of this “bigfoot discovery”. I may be wrong in saying this, but doesn’t that remark smell of greed and exploitation for personal gains? Story and more pictures can be found at wired.com. Bigfoot remains or a very good costume? If you’re like me, you most likely have a radio station streaming while you’re working on the PC or browsing the web. Here’s a very cool site for online radio stations streaming, on demand or otherwise. The signup is free and it lets you save your presets for easy bookmarking of your fav stations. The paranormal selection is not too bad, but could use a few more selections. The link goes to the paranormal selections, but definitly check out the rest of the site for jazz, world music, metal and a lot more. Actual bigfoot remains or another hoax? A supposed dead body of an dead bigfoot was found in Georgia recently. 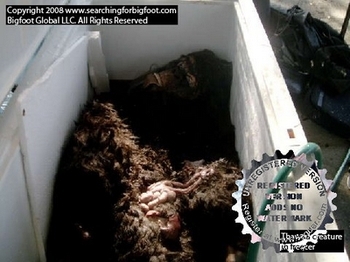 A picture of this bigfoot carcass can be found on the earthfiles.com site, on the front headlines page. One might almost be convinced at first, but remember that with todays technology and very good model makeup, movie FX style, hoaxing a dead monster carcass is doable. But, if this is authentic, then the first remains of this creature prove without a doubt that the bigfoot legends are true. open only to credentialed members of the press, not to the public. where Matthew Whitton and Rick Dyer say they recently found the dead animal. The hard part is now taken care of…paper work, lawyer meetings etc., and updates and postings will now resume. I do appriciate your patiance and understanding. Making a move from one end of the U.S. to the other, especially when you’re moving a housefull of furniture and all that can be time consumeing and frusterating when you’re dealing with a boat load of little things. I’ll be posting new items, so once again, I apologise for the long time of no posts and updates. Updates will be sporadic at best due to my wife and I are getting ready to move into another state, a few real estate deals were taking forever to complete. We’re packing an entire housefull, so right now the moving part is taking up a lot of time.